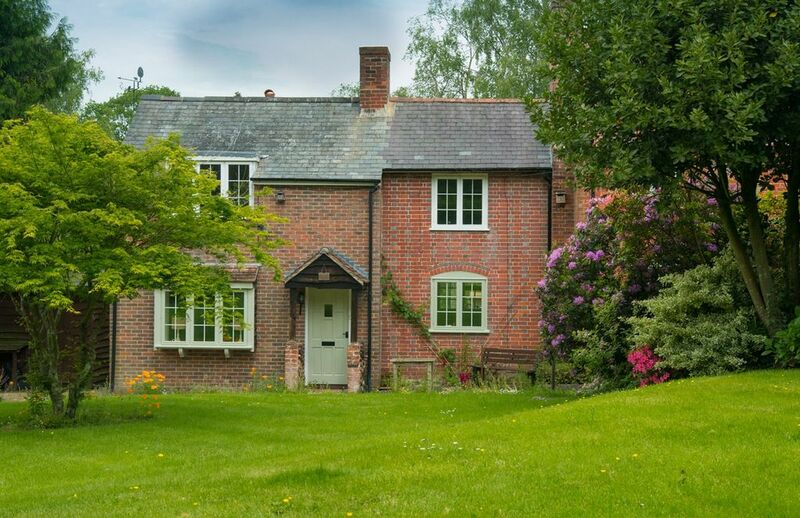 Located in the heart of The New Forest in the beautiful hamlet of Bank, Acorn Cottage is an idyllic place to stay, wether for a family retreat or for a romantic getaway. The cottage, much of which dates back to 1760, retains charm & character but features all the modern appliances you will need for a relaxing luxury holiday. There are gorgeous 3 bedrooms that sleep 6. Set in an acre of garden on the open Forest where the New Forest ponies & cows are your frequent visitors, as well as the ducks that live in the garden. Newly decorated, we offer exceptional quality, comfort & luxury. Downstairs there is a fully equipped cottage style kitchen with a dining area and separate utility room, lounge with wood burner, dining room with inglenook fireplace & garden room all with views over the extensive gardens. Upstairs there are 3 bedrooms, the master bedroom is an en-suite bathroom with stunning forest views & king sized bed, a second bedroom with king sized double bed and a third that can be a twin or children's room (with a travel cot & matress) & a family bathroom with shower. The large secure front garden has a lawn area and various outside seating to enjoy the all day sunshine. The large back garden is divided into 2 sections, the first an enclosed area with outside lounge seating & BBQ on raised decking with steps down to a patio dining area and lawn which overlooks the rest of the garden. There is pretty pond area, which is fenced off from the house & main garden, with a pontoon and small pond house where you can picnic and watch the ducks and the occasional Kingfisher whilst overlooking the beautiful Willow Tree and tranquil surroundings. There is a great country pub a short walk away and the local village of Lyndhurst is close by offering a wonderful selection of shops, bike hire, coffee shops and places to eat. The picturesque village of Brockenhurst is a 10 minute drive or bus journey away (with the main line train with frequent trains to London and the South Coast). The New Forest is at your doorstep with endless walks, cycle paths and places to explore & enjoy. If it's a beach you're looking for, just 20 minutes away you have the choice of the beautiful sandy beaches and beach huts of Mudeford or the marina and stunning town of Lymington where crabbing and fish and chips on the quay are a must. A fantastic family cottage offering a beautiful, peaceful location but with so much to do - a perfect holiday home. We live in Lyndhurst with our young family. Whilst this is our first holiday cottage we have both worked in hospitality for over 25 years. We have walked and cycled in and around Bank and always thought is was one of the lovliest places to live in the Forest. We were delighted when we found Acorn Cottage for sale and bought it after the first visit! Dishes, glasses and fully equipped kitchen utensils ,cook and bake ware & all important cookery books! Outdoor decking area with comfortable seating area and outside dining table & 6 chairs in the back garden. Seating area in front of the cottage to enjoy the all day sunshine. We had a wonderful 3 days at Acorn Cottage. The cottage itself was beautifully presented and the location is fantastic. Walking straight out the front door into the New Forest is hard to beat. You get to finish your day with a pint or bite to eat in the local pub which is a short walk from the cottage. Maria is a fantastic host who clearly goes the extra mile. By far the best host we have had at any holiday rental home we have stayed at. Acorn Cottage was the perfect place for our family long weekend getaway. It is an idylic cosy cottage in the heart of the New Forest with stunning surroundings which gives you the most authentic countryside retreat feeling. The cottage itself is beautiful and maintained immaculately by the lovely Maria, who went above and beyond to make our stay feel so special. We went with 5 adults, and baby and a dog and it was absolutely perfect - there was everything we needed for everyone. Would recommend at any time of the year, this place would be spectacular in the sun, the snow, the leaves of autumn or the buds of spring. Warm welcome, perfect location just what we wanted in a short break. Home from Home, highly recomended! This was our first time to the New Forest. The cottage was beautiful and very comfortable. It was in a peaceful location but still within walking distance to Lyndhurst. We enjoyed seeing the New Forest ponies every morning. We absolutely loved our stay at the cottage and would come back again. Maria, our host, left an amazing welcome package! We were welcomed by Maria, who made us feel very welcome. She provided us with an Easter Cake, bread butter and Acorn Cottage jam, and a bottle of wine. Oops nearly forgot the Easter eggs. The cottage is in a lovely area, with forest walks and cycle tracks on your doorstep. It was well equipped and thoughtful presented. The garden was fantastic for our little dog, very safe. The large pond in the garden was such a delight to walk around and see the wildlife, and feed the fish. Comfy beds insured a good night's sleep. Would thoroughly recommend, and would love to visit again. Bank is situation close to the large village of Lyndhurst, known as the "Capital of The New Forest". You are in the heart of The New Forest with miles picturesque walks and cycle rides (over 100 miles of waymarked family friendly rides) & places of outstanding natural beauty to explore. Local attractions include Paultons Park & Pepper Pig World, The New Forest Aqua Park, Beaulieu Motor Museum, Lymington Salt Water Baths, New Forest Wildlife Park and many more.